It appears that the only extra thing that you need to get Openfire up and running on the Raspberry Pi is patience (lots of it). Mostly it's because the RPi is so much slower than a normal desktop system. Installing the prerequisites takes longer. There's quite a few if you're installing all of the pre-reqs on a clean install of Raspbian. I cheated a bit and used a MariaDB install running on a nearby GoFlex (also a bit slow). Performing the configuration piece of Openfire is what takes the longest. 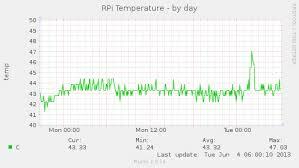 Below is a temperature graph of the RPi in use. The spike, just after midnight on Tuesday, is about an hour long. This was only the piece between filling in the administrator's password and clicking next. This is where the install scripts go off and populate the database, add plugins, and generally tie up the processor. At the time of this post, Openfire has been running about 2 days without issue. According to the "Server Information" page in Openfire, it's running version 3.8.2 on about 15 MB of memory and top is reporting a server load that fluctuates between 0.03 and 0.10. Java being the most active process. This weekend, I'll need to install all of the other plugins and the two bots which watch the DMS. I'm hoping it doesn't eat up too much more processing cycles.